Generally, people tend to be more attractive more on shirts rather than pants. The shirt is an important element that grabs a place in everyone’s wardrobe. Whatever the occasion be, shirts had to be given more importance than pants as they are the best to carry on. These shirts can be worn by everyone like men, women, boys and girls. One thing that many had not paid attention was that why the pockets of shirts are positioned at the left side only? 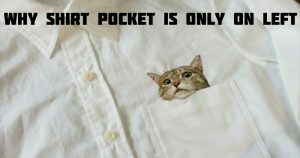 However, some modern shirts are even designed with pockets on both sides. Yes. The pockets are always located on the left side of shirts and not on right and here is the reason behind it. Though it seems simple, it is one of the supporting answers. You may get a doubt that what if the person is left-handed and having a pocket on his left side of the shirt? Most of the people are right-handed rather than being left-handed, the above answer can be stated very relative in that case. The other reason is that keeping something like coins, lockets or anything else in your left pocket will stop you from any attacks like bullets or harmful objects penetrating from heart.